I went out with the team to the New York Times printing presses in Flushing this weekend to drive the car around in one of their lots. The facility is huge (I think it takes a solid fifteen minutes of walking to get from one end to the other) and their parking lots are correspondingly big. It was the first time that we've taken the car out since October, and we've gone through very major changes to many subsystems -- a new intake, a new differential, a cable clutch instead of a hydraulic clutch, and some major frame modifications. We have to prove the car all over again and then make sure that each of our drivers is comfortable driving the car and ready for competition. The event was very useful -- we found a lot of bugs that need to get fixed over the next two weeks. First and foremost, our charging system is broken -- something that I knew about for months but put off way too much. This limited us to a total of 15-20 minutes of driving with a big lead acid battery hooked up in parallel to our tiny two pound LiPoly battery in a total wasted charge setup. The problem seems to be that the regulator/rectifier that converts the 3-phase 60 VAC output of the generator on the engine gets blown out. We run more electrical systems than the stock motorcycle setup and abuse them more -- an electric water pump, a lot of starter motor abuse, and a lot of driver-facing electronics -- that probably over strain the stock rectifier/regulator. I am going to try to hook up another stock R/R and have it hook into the electrical system on a relay controlled by the ECU on engine RPM because I think that the extra power demands of the starter motor at engine start are the biggest strain on the rectifier. Other bugs that we found are also significant -- we had to kludge an extension mount for our amazing carbon fiber intake because the frame wasn't designed to fit the intake to begin with, but the extension mount seems to leak a little air -- you can hear the hiss of air leaking when the engine is running and it's not coming from the air filter on the intake. The intake is also cantilevered and the mounting flanges are cracking out of the intake runners because of vibration induced crack propagation. We're going to have to hack in another stiff mount at the top end of the intake to fix the problem. Our brakes aren't in great shape either. We did an acceleration test and tried to lock all four wheels but only two of four locked up. I don't know much about the brake system so I can't say much about how we're going to fix it. Also, the car didn't leak any water or oil -- that's something that we've had some big problems with in the past few weeks that would have led to a swift disqualification at the competition. We've learned the hard way that you have to do a very thorough job of cleaning sealing surfaces and then applying sealant to them to avoid leaking problems, even in areas that are not highly pressurized. I spent most of my day on another project that I am heavily involved with -- the Cooper Union Formula SAE race car. 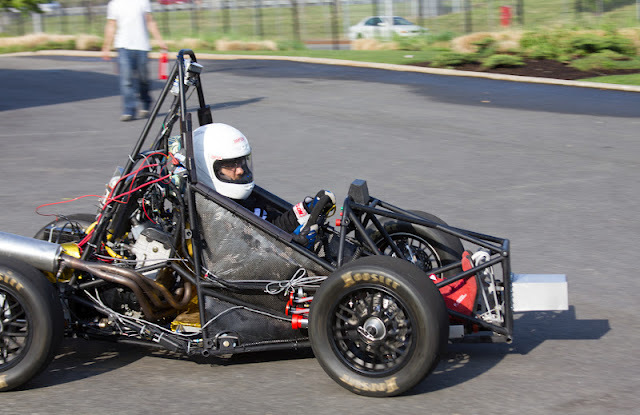 FSAE is an international competition in which collegiate teams build race cars practically from scratch with an eye to smart engineering and economical development. I am the engine tuner, wiring guy, and jack of all trades on the team. The current car has been nearly three years in the works (unfortunately) but we've been testing it since the beginning of this year. It's been a crazy experience and I've learned a tremendous amount from it. The engine we use is from a Suzuki GSXR 600, a Japanese sports bike that redlines at 14k RPM. The competition rules stipulate a 20 mm intake restriction to choke the engine power, but we still produce about 65 HP brake torque, and there are (bigger and more resourceful) teams that get almost 100 HP out of the thing. I learned a lot from working on the engine -- electronics and sensor wiring in an environment with high EM interference, reliable wiring techniques, and all the fine details of tuning a modern EFI engine. I also appreciate how insanely complicated these engines are -- I have immense respect for the engineers that designed the thing. We're taking the car out for track testing and driver training this weekend. Hopefully we don't suffer any major breakdowns or setbacks -- if we manage to break in and debug the whole car by the competition date on May 8th we'll be in great shape. I'll try to take some pictures this weekend, but it's hard to capture how excited I am about it. It's been a while since my last post and I have nothing new to report about the Nixie Clock project. I haven't been sitting still though. In February I got my Ultimaker 3d printer kit. It's a fused deposition modeling (FDM) 3D printer design -- basically a glorified hot glue gun. I had a lot of misgivings about the design before I got the printer because I thought it wasn't mechanically robust or well-designed. The whole thing is made of lasercut birchwood, and I had no idea how it could have good tolerances with such a design. When I got the printer, I had to spend a few weeks on "calibration" -- belt alignment, print bed leveling, print temperature adjustment -- before I got good speed and accuracy. Unfortunately, I don't have any pictures of parts that I've printed yet but there are some good references and examples online. I'll take some pictures soon of some parts that I have printed out that have impressed me -- either for their mechanical stiffness or the good resolution that I was able to achieve. Amplifier PCB. Look at those fat traces. I had to leave one wire unrouted because there was no were left to squeeze it on -- I'll fly it across the board. 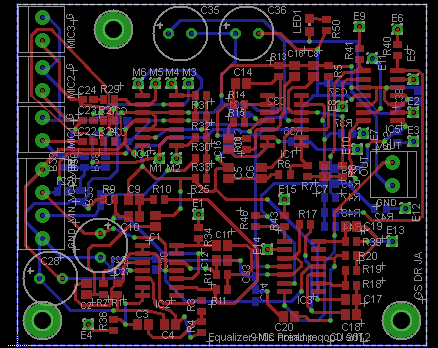 Equalizer PCB. I tried to stick to SMD components as much as possible to save space. The opamps are OPA1644 -- really nice quad chips from TI. Nearly all the resistors on the board are 0603 package. It'll be fun soldering them. 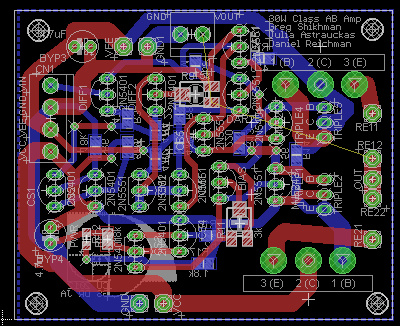 I am getting the boards done through Laen's batch order service. He has a really pretty purple soldermask and the boards usually come back with gold ENIG plating instead of cheaper tin HASL plating. I can't wait to get them back, but there is a +2 week turn period from order to delivery.